Recently I was asked to create a card to accompany a group gift for a baby boy. I didn't have a dedicated baby stamp but as I looked through my stamps I came across the Very Special Someone stamp from the Chalk Talk set. 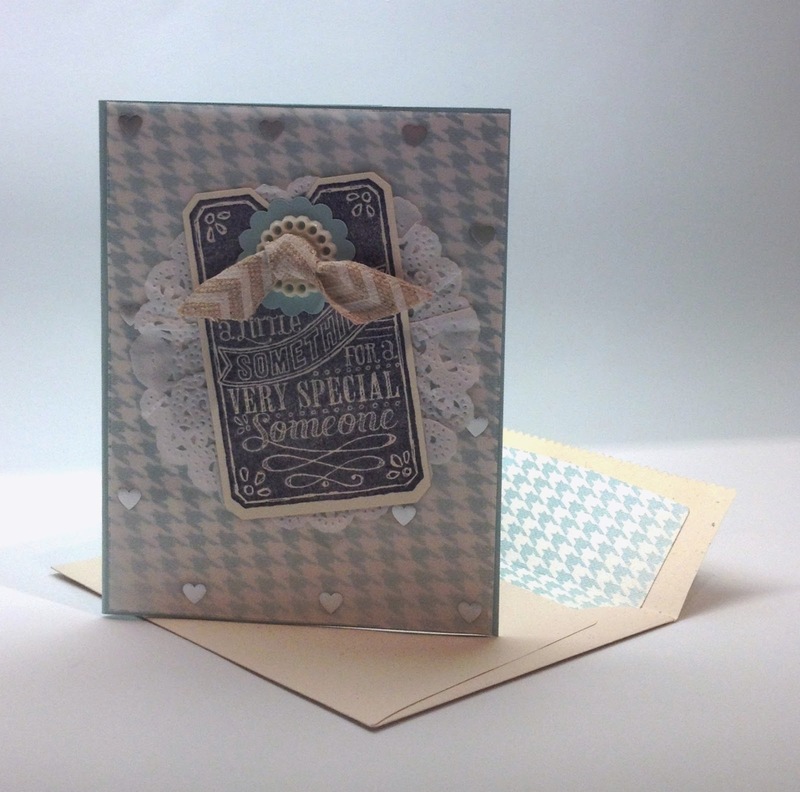 I love the chalkboard look and thought this stamp was perfect for a baby card! Here is the card. I realize that the ink color in the photo looks blue (or at least it does on my monitor) but I actually used Basic Gray ink and in real life it does look gray! Black was too harsh and Basic Gray looked more like an actual chalkboard. The blue hound’s-tooth DSP was perfect for a baby boy but I thought it would be nice to soften it a little with a layer of Foil Vellum with the sweet little silver hearts. Since most adhesives will show through the vellum here is a hint to attach the vellum to the DSP. Hide Mini Glue Dots behind some or all of the foil hearts. The Paper Doily was added to create even more baby softness. Katie, This tag has never screamed "baby card" to me, but you just made me a believer. What a sweet card! Thanks Brian! I wouldn't have predicted it either, but I looked at each of my stamps and thought "would this work for a baby?" and when I got to this one I said "yes"!! Very sweet card! Love all your layers. Thanks Imogene! You are very sweet to say so. Glad you like it!